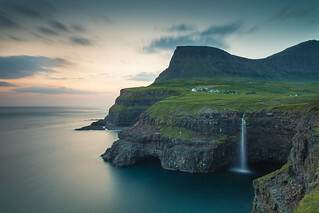 I first visited the small village of Gásadalur in the Faroe Islands some twenty years ago, when it was accessible only by boat or by walking over the surrounding mountains. Today the once secluded village can be reached by car and last summer I went back and brought my photography gear. Of all the photos I've taken, this is probably my personal favourite. I have, however, never been quite happy with the original edit, so here it is again. Thank you for viewing and for any comments.